Lately I've been back in full force as you may have noticed. Since I know myself far too well, it won't be too long before I will be on hiatus again. Today I'd like to talk about the work of one of my favorite artists which I also happen to share the citizenship with. I was reluctant in the beginning to write this post since her work is published in Italian but some days ago, I learned from her publisher that they were planning to expand abroad so maybe there is the chance to find her works even translated in the future. That's what I honestly wish to her and several of her colleagues since they truly deserve a chance. 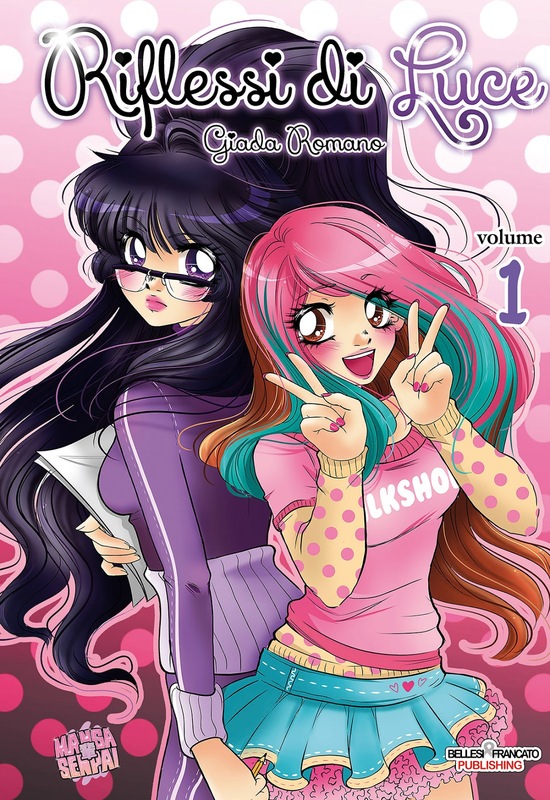 The comic I am talking about is "Riflessi di Luce" (could be translated as "Light Reflections"), an Italian Shoujo Manga published by Mangasenpai Editions created by the Italian artist Giada Romano, also known on the web as "the LostJade". The first volume was published in 2015 currently, the series features totally 3 volumes and it's still ongoing. Luce Viola is a 17 year old Italian girl who dreams to become a mangaka one day. She loves to draw and spends a lot of time on it. Despite being drawing her greatest passion, she knows far too well that her dream is hard to happen, being settled in a country in which original Japanese stories are more appreciated than Italian ones, who are mostly seen as a rough copy of their Nipponese counterpart. Stuck with this awareness in her mind, she decides to focus on studying languages in high school instead and works hard to keep her scores high in order to gain a well paid job. Luce is not really interested in her outside appearance and she shows it by dressing up in anonymous old jumpsuits. She also has a pretty cynical view on those who actually spend a lot of time (and money) in taking care of their look as she is strongly convinced they are all empty and rotten on the inside. The protagonist's negative opinion on other people is heavily affected by personal, sad happenings in her life including her being bullied by a groups of chicks in her class. Her opinion on the outside world dramatically changes when she meets and confronts with Giada, her boss at work and Leonardo, a guy from her same high school, who try to open up her views. She will slowly find out that reality is not as straight as she thinks but has several shades which cannot be seen at first glance from the outside. This will lead her to reconsider her opinions on people, seeing the positive sides of the ones she judged bad and the negative reflections of her loved ones. Giada Romano, also known as "Giada-chan" or "the LostJade" is an Italian polyhedral artist. Since when she was just a kid, Giada developed a strong interest towards Japanese animation and comic book series. As she declared in more than one occasion, her very first approach to drawing began after watching Ranma 1/2 , aired on a local TV channel. She used to draw characters from the series to hang them on the wall as posters (the mirage of the internet). Since that day, she never stopped practicing and her first success as an artist came along with her first drawing publications on the monthly magazine called Pokèmon Mania (Pokèmon World) on which she shared her Pokèmon fanart, receiving supporting words and compliments from the magazine readers. Later on, with the Netlog era, her popularity as a public person grew also thanks to her idea or creating an handmade kawaii style clothing brand which is sold on an online shop she manages by herself called Milkshop. She became popular on YouTube thanks to her video "Draw my life" which reached over 1.000.000 views. Despite using her ability on creating clothing and accessories, Giada never gave up on her objective to become a mangaka. She attended an art based high school and later on enrolled in Milan's Comic Academy from which she later dropped out due some personal issues. Her long time dream eventually took place in 2015 when the first volume of her original production "Riflessi di Luce" came out, published and edited by Mangasenpai. Nowadays, her activity isn't limited to the continuous work on her own comic and clothing store as she uses her YouTube channel to make drawing tutorials and sometimes publishing short self-produced cartoons. The autobiographic component in this comic sure is evident. I have been following the author for quite a long time now, years before her manga publication and as you can even notice from her "Draw my Life" video, several events happening in the story are adaptations of what the author actually went through during her life. What is peculiar about this comic is the way Giada adapted the autobiographic component: usually in autobiographic stories, the element is incorporated in one single character who represents the author, in this case the autobiographic element has been split in several pieces and engulfed in different characters which represents different moments and ages of the author's life, all perfectly fusing up to form one single plot. This way, each character show us something about the author still maintaining their peculiarity inside the overall plot. According to me, this is just brilliant. She did a perfect job in mixing fictional characters and facts to real one. Long time fans will surely recognize the real elements hidden in plain sight within the pages. Another aspect that shot me right in the feels and made me want to go on reading this comic even though I am not a Shoujo fan at all, is the author's work to make all characters more real even out of the comic context. As someone who writes original stories myself, I have a kind of personal relationship with every single character I create, they are just like my own babies, I don't see them as mere pieces of paper spotted in ink, they are the equivalent of a flash and bone people. I suppose this is a feeling almost every single author has, however, this component often doesn't come out, it isn't properly transferred to readers. In this case however, even as a reader I could actually feel the characters as more than simple ink lines. Maybe because I've followed the artist for a long time or because I can somehow relate to them, I just can't define it. Sure, Giada's putting her best effort to literally take them out of paper. 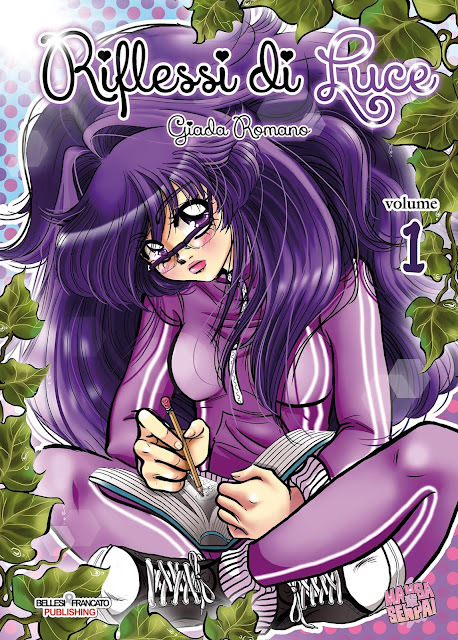 This is made either to the manga locations, all existing and all settled in small Italian realities, by giving in the manga some space to her own online shop (actually a physical place in the manga) and last but not least by producing an actual demo containing original songs for the fictional band in her comic. This new is pretty fresh and when I heard about it I was really glad about it. Despite being an Italian comic book, it perfectly suits the Shoujo category. 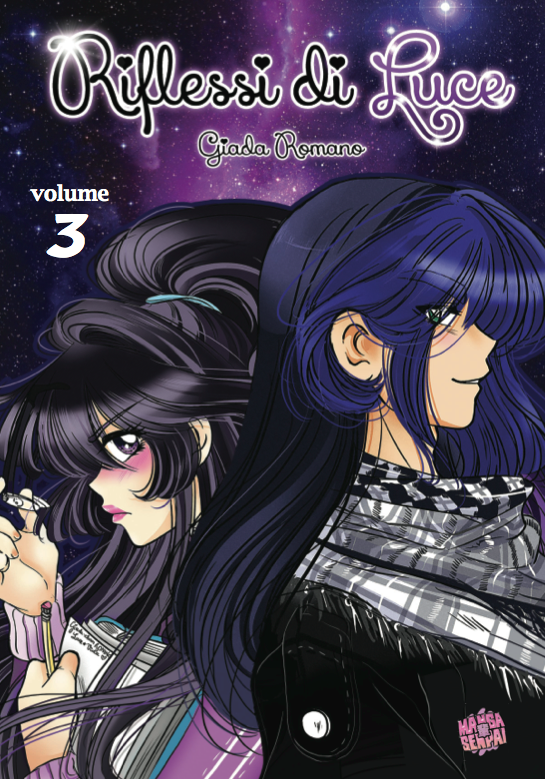 Giada choose for her manga an art style which resembles the 90's Japanese art style under which are grouped some of the author's favorite series like Sailor Moon, Ranma 1/2, Inuyasha and Lamù. Being born in '92, I couldn't have appreciated this choice more since it keeps me pretty nostalgic, another element to add on the list of reasons I decided to read this comic. To sum it up, if you are into Shoujo manga this is a reading I would highly recommend because despite sticking to the genre, it has some original points that makes this series break the typical clichès associated to the category. It is a Japanese-style comic which doesn't deny its roots, firmly grounded in the northern side of this western country called "Italy". I know this is currently just published in Italian but as I mentioned above, the editor seems to be planning on expanding their audience to foreign readers so I really hope for you (and wish it for the authors) that soon you are going to be able to read it in English or other languages. If you want to find out more about Giada's work and other comics published by the same editor, I'm leaving you some interesting links below. That's all folks, see you and up to the next post!